Many falls do not cause any injury. However, one out of five falls causes a serious injury such as a broken bone or a head injury. This further leads to limited activity, reduced mobility, loss of fitness and an induced fear of falling. As per a report on unintentional injuries by National Safety Council, fall-related injuries are the leading cause of death amongst the elderly. Centre for Disease Control and Prevention puts forth some facts and figures highlighting the gravity of falls and resulting injuries. Every year, nearly 2.8 million adults aged 65 and above are treated in emergency departments for fall related injuries, mostly heady injury or hip fracture. Advanced age of 65 and above. Patients with low blood pressure and previous history of stroke. Medical conditions such as diabetes, Parkinson’s disease, arthritis, Alzheimer and other dementia. People with cataract and glaucoma. Medication which affects the nervous system such as sedatives, antidepressants, analgesics, diuretics, and laxatives, can increase the risk of falls. So, it is important for the elderly to follow a healthy daily regimen. This should include an appropriate physical exercise which enhances balance and coordination. A regular eye check-up is essential to keep a check on the vision. If on medication which causes dizziness, try avoiding any unnecessary movement. Assistive devices such as canes, walkers, and wheelchairs will definitely help in fall prevention. A safe and secure living space is required for fall prevention and avoiding injuries. Uneven walkways can pose a serious threat to anyone’s mobility. These and even the pathways should have an even surface and should be free of any clutter. This can be done using portable ramps. The stairways should have handrails on both the sides and they should be securely fastened. Floor coverings should be even and should not have a skiddy surface. Loose mats or sliding rugs will increase the risk of falling. The rugs should be secured to the floor with double-sided tape. 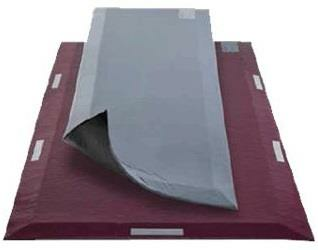 The Comfortex Landing Strip Injury Prevention Floor Fall Mat has an ultra-high-density core foam. Non-slip vinyl base securely fastens to the floor. It needs to be placed on the bed. While it helps in fall prevention, should any fall occur, it transfers the weight of the person across its surface. Wall-mounted grab bars are required at the toilet, bath, and shower. Bath mats should be secured to the floor with non-slip, double-sided tape. Bath/shower could have non-slip strips. Utmost safety needs to observed during any movement in the washroom area. A raised toilet seat or the one with armrests can be of a great help in avoiding any falls. The Carex Textured Wall Grab Bars can be used as an added safety measure next to the bathtub or the toilet. It is made of durable heavy-duty steel and is available in different sizes. 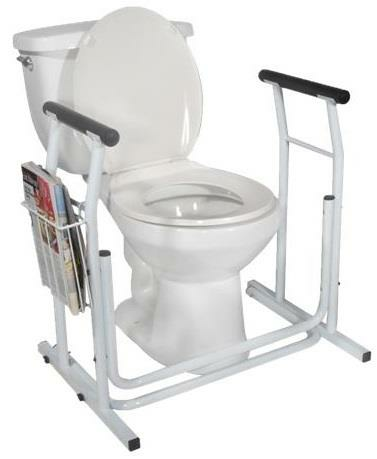 Likewise, the Drive Stand Alone Toilet Safety Rail fits around a standard toilet. Padded armrests are an additional safety and comfort feature. If possible, the furnishings should have an adjustable height. Frequently used items in the kitchen or anywhere else in the house should be placed within reach. Low intensity or high glare lighting should be avoided. Nightlights are required in the entire house. A lamp right next to the bed will be handy for the night. Any dark and dingy corners should be avoided unless properly lighted. Flashlights should be stored for any power-cuts. Better-fitting and properly hemmed outfits which do not drag on the floor will also help avoid any tripping. The shoes should have anti-skid soles and should be of the right size and fit. Heavy orthopedic shoes should be avoided. Rubber crepe soles which tend to stick to the floor surfaces and high heels should surely not be used. 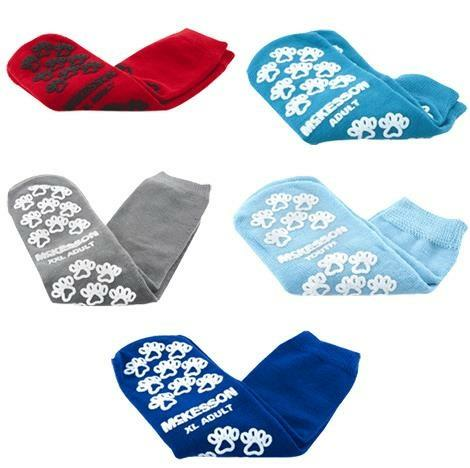 The McKesson Terries Double Imprint Above Ankle Slipper Socks, are soft and breathable nylon knitted. They are elastic and adjust to the foot’s shape. Their anti-skid sole makes them very useful to avoid falls. Newspapers, boxes, electrical and phone cords, plants, furniture, etc. should be removed from the walkways. So, let us come together in ensuring due care to the elderly. Fall prevention is manageable and the resulting injuries can be avoided to a large extent. We create a safe living space for them and ensure they use the right footwear and assistive walking aids.